On the same day as the new fully professional FA Women’s Super League begins so to does the county league season get into full swing across the country. 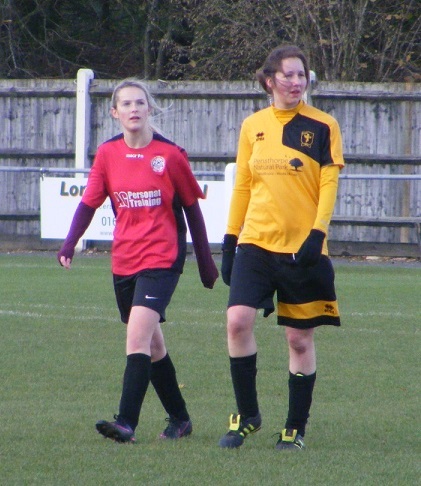 Beginning the season in Norfolk a game from Division Two with Fakenham Town Ladies hosting Tavern Ladies. Two divisions in Norfolk once again this season, that decided late on however with a host of new sides wishing to join the league, teams thus didn’t know where they would be placed, as it was a few never got going and a possible North/South split to a Division One never happened, 8 sides will contest the top division with 12 sides making up the 2018/19 roster in Division Two including 5 new sides. 3 stepping up from youth football. 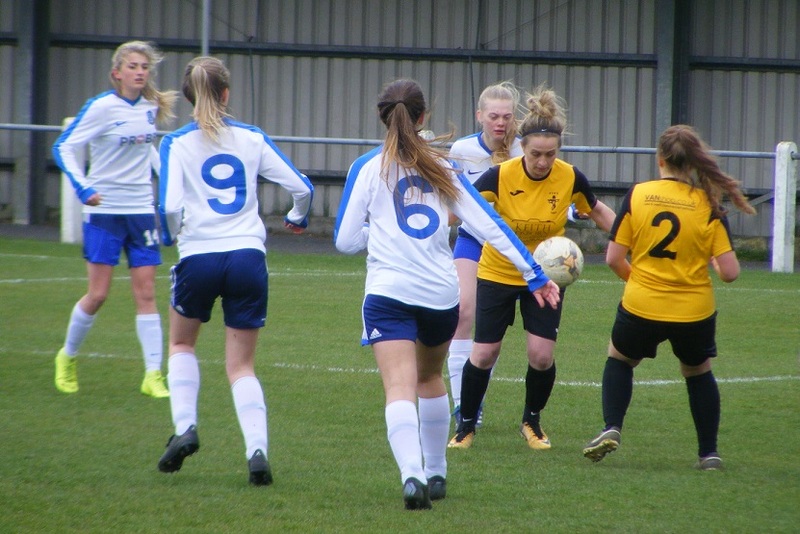 Fakenham Town Ladies drop down to Division Two, not necessarily a bad thing after struggling for results for the previous two seasons, an opportunity to rebuild, strengthen and regain morale. Starting the season with a smaller squad than they would have liked but one that is very much an integral part of the larger Fakenham Town football club. Very much a community club have teams playing at youth level from U6 to U17, an U18 means sides, Reserves, Ladies, Veterans and of course the 1st team playing in the Thurlow Nunn League. 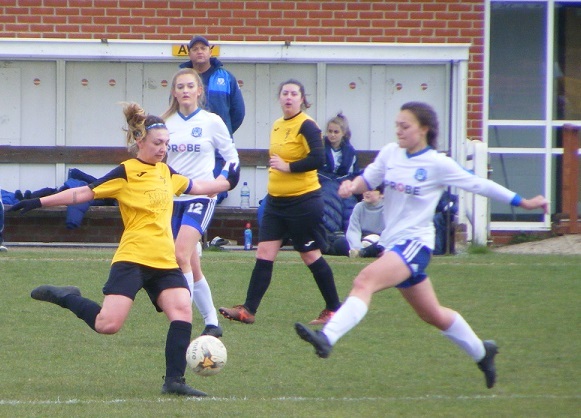 Tavern Ladies, are a Dereham based side have been together for the past 2 season’s having previously been Dereham Ladies. Sponsored by The Railway Tavern in Dereham a pub I myself have frequented a few times in my younger days being a Dereham boy myself. Results improving with the name Tavern finished runners-up two seasons back and 3rd last season, will be amongst the sides threatening at the top once again in what is a much larger Division Two. Clipbush Park the venue for today’s game plenty of activity at the ground already with several youth sides having been in action over on the pitch behind the ground itself. The Ladies game advertised on the entrance to the ground situated in a busy roundabout leading into Fakenham itself. Playing on the main pitch fitness will be a key factor as it is one of the largest and widest in the league. Looking good at the start of the season a small seated stand along the far side of the pitch people more likely to converge on the clubhouse beside the pitch on the near side leading into the ground offering hot drinks and a bar. Cloudy overheard with a cool and brisk breeze blowing across the ground from one goalmouth to the other. Nothing over concerning but it would play a factor in the game especially first half. 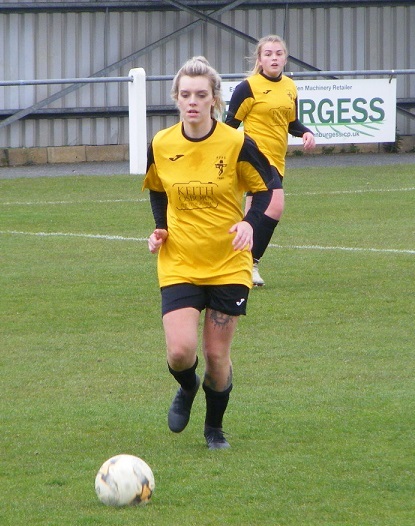 Fakenham Town Ladies starting XI – Chloe Easter, Ellie Websdale, Jemma Riches, Maddie Smith, Laura Merin, Sian Sands (C), Tara Betts, Fanny Dankskanen, Kayleigh Robb, Jemma Riches, Jennifer Codman & Sam King. Subs – Anna Palomino & Sophie Anderson. 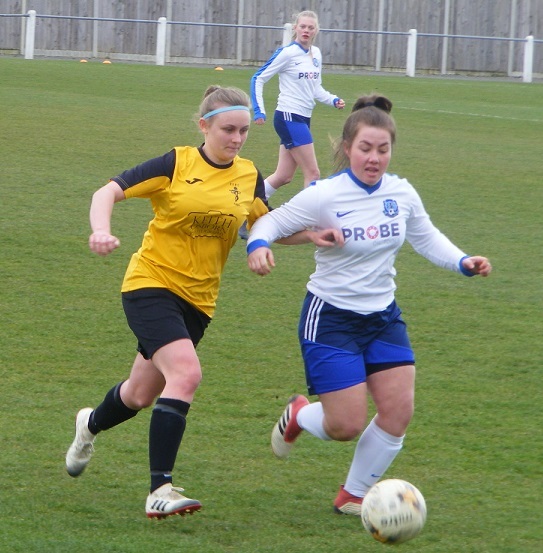 Tavern Ladies starting XI – Zoe Gibbons, Roxanne Bailey, Rachel Casey, Charlotte Allum, Sophie Fuller (C), Emily Bell, Jordie Head, Lanta Griffiths, Lucy Lincoln, Lucy Kean & Katie Hart-Copsey. Subs – Dani Lee, Meganne Carmicheal & Lesha Bagura. It’s Fakenham wearing yellow shirts with black across the left shoulder, black shorts and socks to get the game underway with Tavern lined up opposite in an all blue kit. Tavern press the ball early keep Fakenham pinned back inside their own half winning a series of throw-ins on the left wing without finding the final ball into the box, Fakenham regain possession the ball put long up the right wing Sam King peeling away into space takes the ball on to the corner before whipping in a cross into the area the ball headed clear by Tavern’s Charlotte Allum. King pressing with the ball on the right again closing in on the box looks to drop her shoulder push the ball inside cut out by Lucy Lincoln the corner conceded. 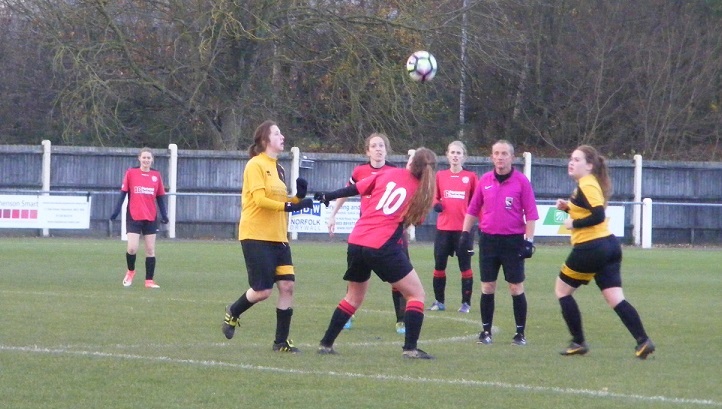 The ball angled in towards the near post from the right by Sian Sands, Fakenham’s captain, is headed behind for a 2nd corner kick, this one put in longer Zoe Gibbons playing in goal for Tavern comes well through bodies to punch the ball away. Tavern look to break, Tara Betts nips in to win the ball back for Fakenham on the left side before being upended the foul given by referee Andy Waite. Betts to take it herself 25 yards from goal hit along the ground races wide and out of play at the near post. 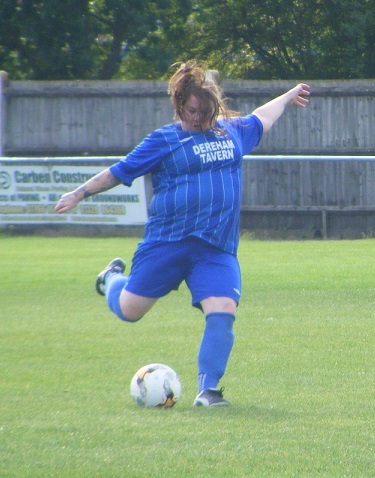 Fakenham are testing the Tavern defence, King with good movement up front making herself available for the ball. Jordie Head intercepting a forward pass turns and puts the ball out to the right for Lanta Griffiths to chase, the Fakenham defence converging on the attacker outnumbered the ball is lost the home side bring it forwards, Sands, King and Ellie Websdale building an attack in front of the Tavern area, Sands set up for a shot left of the D is closed down by Roxanne Bailey. Tavern look a threat on the break Griffiths with good pace right bringing the ball inside has Katie Hart-Copsey free on the left gives her the ball, taking it on early Hart-Copsey sends the diagonal ball looping up towards the far post the ball running wide of goal. Tavern regain the ball in the middle of the park Emily Bell on for Griffiths, has Lucy Kean with her making a run central the ball into her rolled wide left for Hart-Copsey closer in this time she hooks the ball in towards goal on the angle, on target is safely caught by Fakenham goalkeeper Chloe Easter back on her line. The early stages of the game fairly even, Tavern getting more players into advanced roles when they are attacking. Laura Merin making a couple of vital interceptions at centre back for the hosts, with Hart-Copsey wanting the ball played into her. Up the other end King is the threat for Fakenham looking for space, hustling the Tavern defence shows good strength to win a bouncing ball laid forwards, getting a shot away from 25 yards out, hitting it as it skips up off the surface the strike sails over the bar. 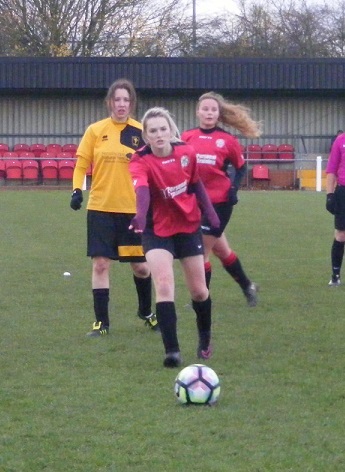 Tavern captain, Sophie Fuller getting control of the ball in the middle combines well with Hart-Copsey to the left as they bring the ball into the Fakenham half Hart-Copsey with a good ball inside to Griffiths making a run right side her 1st time strike is blocked by Merin. The wind is blowing fairly briskly across the ground is holding the ball up a little favouring Fakenham, Sands coming forwards with Jennifer Codman in close support through the middle the pass forwards dropping into the path of King breaking towards the edge of the area Gibbons comes out quickly sliding in to smother the ball at the attackers feet. Tavern counter attack with urgency the ball carried out of defence the pass put long into the path of Griffiths cutting inside from the right, controls the ball well before digging a shot out of feet before she is charged down, her 30 yard effort a foot over the Fakenham crossbar. Tavern are awarded a free-kick in a dangerous area after Merin handles the ball trying to bring in clear for Fakenham. 20 yards out left of the D, Fuller takes position over the ball puts a good ball in towards the far post area the ball standing up in the breeze is headed goalwards by Griffiths blocked at close range the ball drops to the floor inside the six yard box Rachel Casey with a snap shot again blocked. Tavern are enjoying a good spell of possession inside the Fakenham half Hart-Copsey winning a corner, delivered into the near post the ball is headed up onto the roof of the net a 2nd corner kick given, a longer effort this time, Maddie Smith getting it away for Fakenham. Tavern are ready to spring an attack whenever they regain the ball in the middle, Fuller has a good range of passing ability, plays the ball on for Kean central she tries to release Hart-Copsey early on the left side, Merin covering the ground well to get across and put in the tackle. Websdale committing a foul wide left another chance for Tavern to play the ball into their area from a set-piece Fuller sending the ball high into the box, Merin gets her head on it to clear for Fakenham. 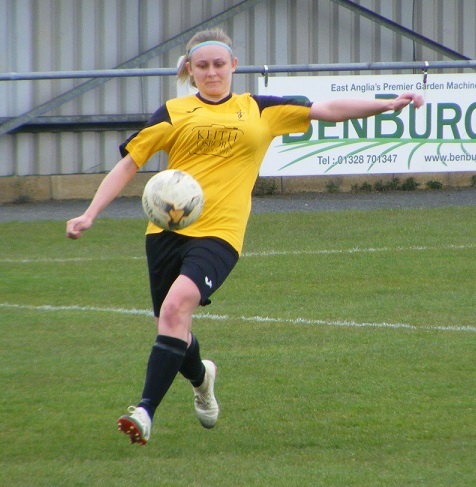 Fakenham make a switch midway through the 1st half Smith coming off, replaced by Anna Palomino. Merin is busy in defence for Fakenham closing down to regain possession. The goalkeepers for both sides have had relatively little to do so far in the match, Easter called into action pulls off a superb double save to deny Tavern the opening goal of the game. Tavern build well players coming forwards through the middle with Hart-Copsey on the ball down the left squares the ball inside towards Kean 25 yards out from goal she helps it on to Fuller coming in central she sets herself for the shot making good contact the ball racing in towards goal, Easter is right behind it but needs to get down sharply to block, stopping Fuller’s strike the ball is loose and Kean racing in on the follow-up is first to it tries to open her body up to place the ball wide of the keeper, but can’t Easter with the double block. Smith returns to the field for Fakenham with Betts coming off. Fakenham push forwards Riches with Sands right side the ball into the area headed away for a throw on the right. Bailey defends well for Tavern up against King as she looks to power her way into the area. Tavern get Fuller onto the ball she spins putting the ball out to Hart-Copsey, her early cross laid in towards the top of the Fakenham area cut out by Merin. GOAL! 35 minutes played and the deadlock is broken Fakenham taking the lead the goal coming from a set-piece given away as Kayleigh Robb is brought down as she carries the ball forwards on the left. Smith to take, 30 yards out to the left of the Tavern goal she strikes it well sending the ball high into the area a little wind assist no doubt helping as the ball drops over the keeper to land inside the side netting 1-0. Fakenham regain possession from the restart the ball played up the line right side by Websdale on for King who carries the ball on to the byline before cutting a cross back into the Tavern area running long for Robb coming in from the left she doesn’t get the ball under control to strike it 1st time allows the Tavern defence to get away for a throw on the left Fakenham press late on the ball put into towards the near post with King lurking, a touch taking it wide of goal the corner given again swung in near post Gibbons takes command of the situation coming to claim the ball. Easter with another important save right at the end of the first half comes out bravely to the edge of her box to slide in and claim the ball at Kean’s feet as she looks to get onto Hart-Copsey’s cross put in from the left. An intriguing first half which sees Fakenham take a narrow lead into the dressing room. Could very easily have been the other way around. Clear cut chances at a premium, defences working hard. King causing all sorts of problems for the Tavern back line not playing off any single defender. Tavern attacking with purpose and pace whenever they can. Easter denying them the lead themselves all poised for the 2nd period. Tavern to get the ball rolling for the 2nd half. The sun has broken up the clouds warmer now and with it the breeze that was prevalent first half has disappeared. It’s Gibbons called into action with a spectacular save in the opening minutes as her side lose the ball is fed into King breaking clear left of the box she aims to shot across the Tavern keeper, Gibbons throwing herself down to the left to push the ball away from goal. 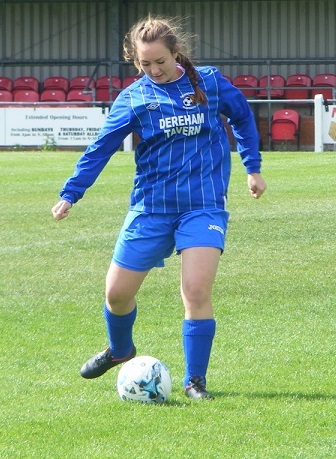 Hart-Copsey operating on the right wing for Tavern now likes to get the ball at her feet and take on players a strong run on the wing she vents her frustration as her final ball from the corner of the area is sliced behind the goal. A busy start to the 2nd half Easter has to come and claim the ball low as it is pinged forwards for Kean to chase, never really gets control of the bouncing ball which enables the keeper to save. Tavern build through the middle Bell onto Griffiths her past long finds Hart-Copsey wide right a terrific cross fired in across the face of the Fakenham goal, excellent defending from Merin at the far post to get the ball away from danger. GOAL! End to end action at the start of the 2nd half Tavern are hit on the counter attack as Fakenham double their lead the ball deflected forwards in the middle sees Codman running free in behind the visitors defence, seeing it down over her shoulder, 25 yards from goal the advancing goalkeeper in her sights she sends the lob over her and runs away in celebration as the ball bounces into the back of the net 2-0. 53 minutes played. Fakenham have their tails up bringing the ball forwards King is played in left of the D she moves across looking for an opening to shoot, taking to long Allum steps in to make the tackle out to Lincoln who sends the ball on for Fuller, Danskanen in to win the ball back for Fakenham. Lesha Bagura enters the game for Tavern moving into a forward position Head coming off. Gibbons catching the ball as Websdale shoots from all of 30 yards out the ball played into her by Riches. GOAL! Fakenham capitalise to get themselves a bigger lead another goal coming about from a counter attack, Tavern having won a corner Fakenham win the ball come forwards with Dankskanen she times her through ball from the right side perfectly for King in the centre running clear Gibbons comes racing out to the edge of her area sliding in as King pulls the trigger the ball past her as striker and goalkeeper collide, racing back the Tavern defence can’t reach the rolling ball in time as it crosses the line 3-0. A delay in play as Gibbons is hurt are the coming together accidental but painful the goalkeeper sadly can’t continue has a nasty black eye for her efforts, walking off the pitch however, Head is the player volunteering to done the goalkeepers gloves for the remainder of the game. Sands comes across to make the tackle on Griffiths as Hart-Copsey attempts to slide a pass into her from the right as she makes a central run. Tavern get the ball forwards on the right Hart-Copsey linking up with Bagura wins a corner on the right played long into the area Lincoln up from the back the target, Smith getting close and heading the ball away for Fakenham. Sophie Anderson is on for Websdale for Fakenham the ball with her on the right moving deep she wins a throw-in. Play stretched now Tavern losing their shape a little Fakenham full of confidence press forwards. Dankskanen winning the ball right slid forwards for King her snapshot from 25 yards out charged down by Lincoln. 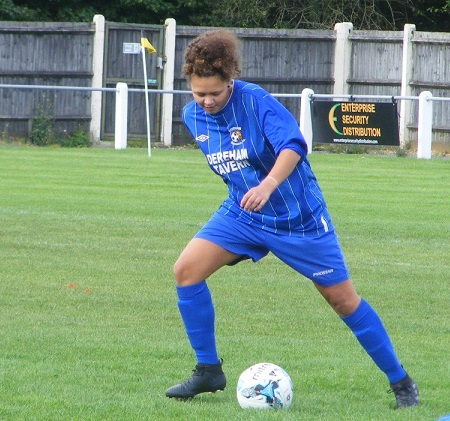 King nips in ahead of the Tavern defence stabbing a shot over the bar as she is alert to Robb’s ball in from the right as she brings it forwards down the left. GOAL! Fakenham go further in front as King nips in to score her 2nd of the game, the build up on the right, Dankskanen isn’t closed down as she picks her past slipping the ball in behind the Tavern back line as King supplies the run coming towards her spins into the path of the ball and right of the target sends her shot across goal into the far corner 2-0. Tavern frustrated nevertheless press on Hart-Copsey with a good run on the right wins her side a corner in towards the near post, Fakenham have it covered concede a 2nd corner this one goes longer, Smith clearing back to the corner taker, Hart-Copsey lines up a ball into the box, it’s Merin who clears with the header for the home side this time. King with a chance for an opening day hat-trick almost a carbon copy of the previous goal Dankskanen playing her in on the right inside the box she takes on the shot drags this one wide across the face of goal. Tavern win themselves a corner on the right the ball played back out to Hart-Copsey sends a driven cross back into the congested area cleared falls straight to Bell 20 yards out right of the D doesn’t get a clean connect sends her attempt wide of the target. 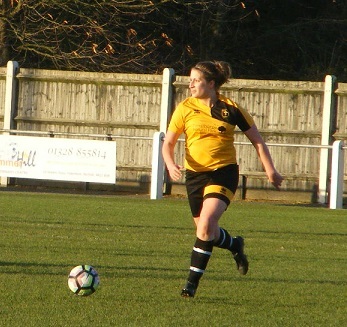 A snap shot struck on the half-volley by Kean from the edge of the Fakenham box as the visitors push forwards on the left the diagonal ball is fired in low towards the area Palomino first to it sends her clearance straight at the on rushing Tavern attacker a good improvised effort loops over the crossbar. The game open now Fakenham break Robb putting a pass out to King drifting free on the right, swings a cross into the area, Anderson near post, Sands central the ball falls between them Allum able to get her head on it to clear for Tavern. Codman picks up a knock for Fakenham comes off the field with Websdale heading back on. 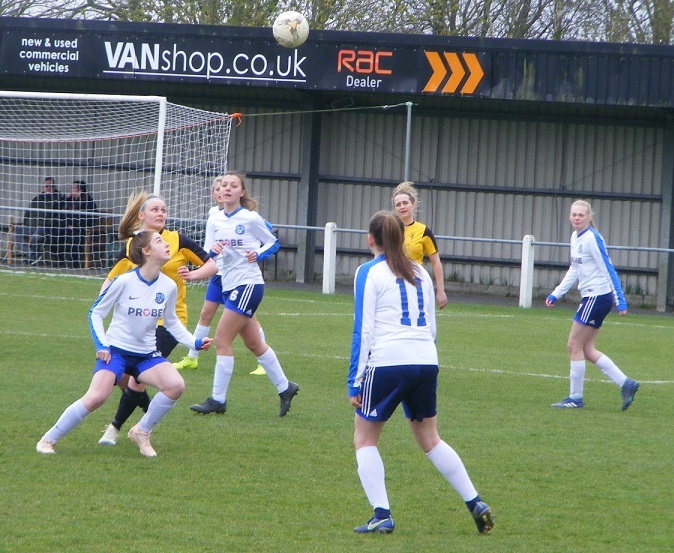 Fuller with a quality strike from the top left corner off the area comes within a lick of paint of pulling a goal back for Tavern the ball cut back across the area towards her from the byline her strike racing across the diving Easter comes back off the base of the far post. Fakenham with a free-kick wide left players go forwards into the area Sands over the ball the delivery long towards the far post a header comes in the ball though driven behind off target. Robb with a powerful run on the ball down the left, can’t shake off Bailey as she tries to get inside her the defender lunging in to win the ball. Betts comes back on to replace Robb the game entering the final minutes. Fuller with a terrific ball forwards for Hart-Copsey on the right wing clear she sweeps in a cross looking for Kean closing in far post, Merin up against her with another top draw defensive tackle to prevent a shot coming in. Even as I’m writing that attacking move down Fakenham are on the counter attack the ball out right fired in across the face of the Tavern goal Anderson closing in on the far post 2 yards out is tackled Bailey I think the ball behind for a corner. Tavern defend the set-piece. All Fakenham in the closing moments Bailey with a last ditch tackle inside the box denies Anderson a shot on goal as she makes a run to the right. The corner conceded playing in from the right isn’t cleared inside the area Fakenham can’t get a shot away Tavern scramble the ball away. 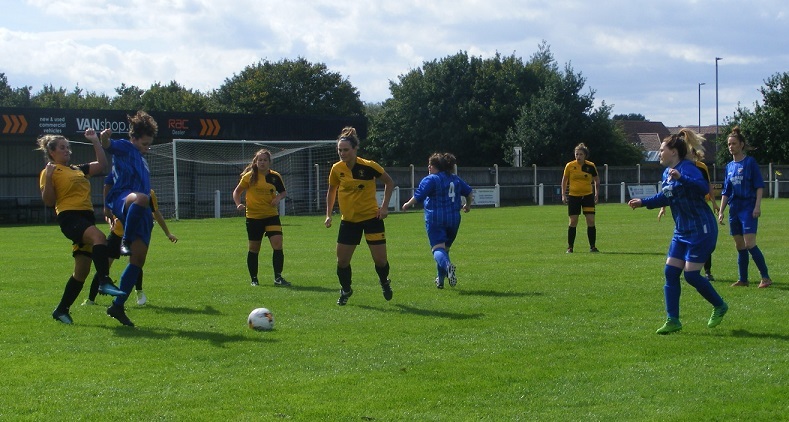 The final whistle blows and Fakenham Town Ladies celebrate with an opening day victory. 4-0 the final score finishing the game stronger capitalising with an early goal 2nd half to double their lead quickly became 3-0 and from their looked to have the 3 points in the bag. Tavern had their chances however and the first half might well have been the side leading themselves. Fakenham were the stronger side in the 2nd period took their goals well. Tavern had chances and on another day they would have capitalised themselves, a disappointing defeat nonetheless to begin their season need to and can bounce back, certainly have the ability. After a couple of difficult season’s this is a very welcome result for Fakenham and one that will do wonders for team spirit. Time to pick this afternoon’s Women’s Football East – Player of the Match. Sometimes they are difficult sometimes they are easy, today’s is the latter. 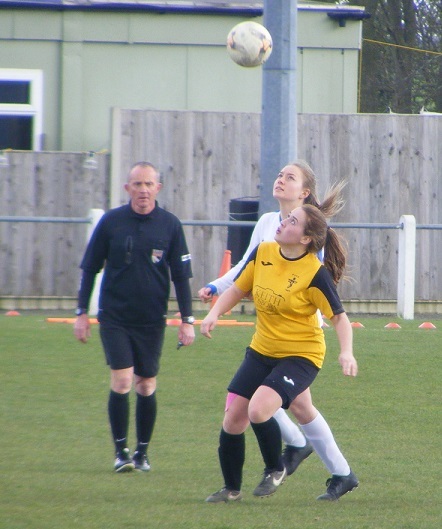 The notes will usually reveal a contender or two but sometimes a stand out performer will present themselves long before that and right from her first interception Fakenham Town Ladies centreback Laura Merin put herself forwards. 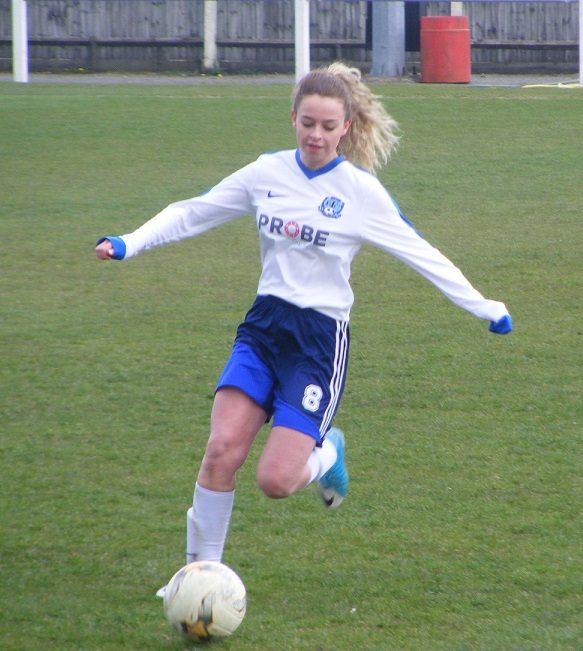 On numerous occasions she was the defender making that interception, winning the header or last ditch tackle. A good contest to begin the county league season, another example of why I’ve fallen in love with the grassroots game, just makes choosing which one to go to next all the harder. My thanks as always to both sides for their help with the team details. 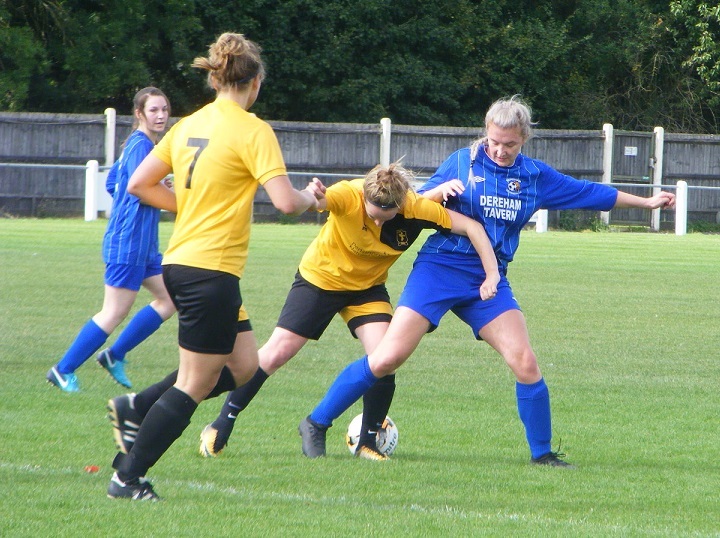 This entry was posted in Match Reports, Norfolk Women's Division Two and tagged Fakenham Town Ladies, Match Report, Norfolk Women's Division Two, Tavern Ladies on September 10, 2018 by WFEast. The football action on Women’s Football East comes from Norfolk Women’s Division One, been a while since I’ve been up to Clipbush Park home of Fakenham Town Ladies to watch them take on Wymondham Town Ladies Reserves. 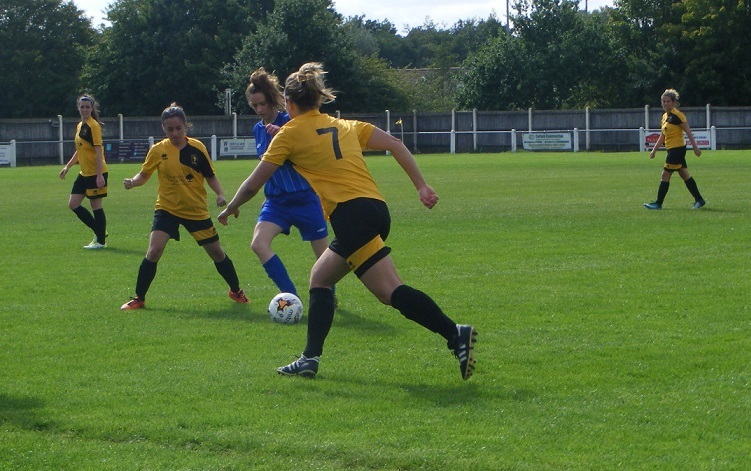 Fakenham Town Ladies are an established side in the top tier of women’s football in Norfolk. Although finding themselves at the wrong end of the table recently without looking in danger of relegation. Are currently in 8th position with just the one win from their opening 5 league matches. 3 points today would get them comfortably into mid-table in what is once again looking to be a hotly contested league this season. 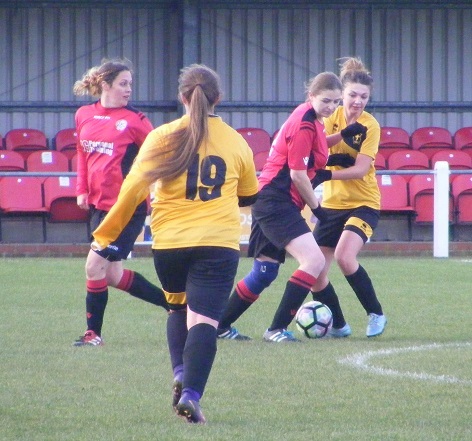 Wymondham Town Ladies are one of the most ambitious sides in Norfolk winning the Division One title two season’s ago have made the set up into the regional league finishing 3rd in their 1st season. Their success bringing in an influx of players and the formation of a Reserves side last season. 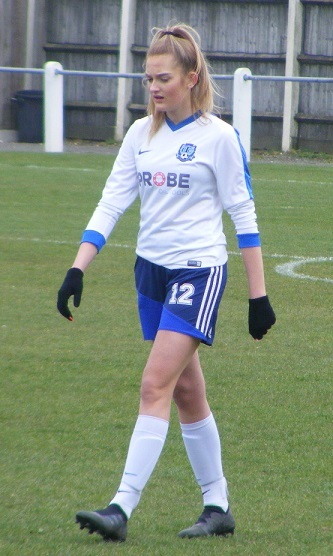 Won the Norfolk Women’s Division Three title last season. Jump straight into Division One this season with the county league switching back to a two league format with an influx of new sides all those in Division Two stepped up along with Wymondham a huge jump maybe but counter acted by the fact Wymondham have a number of their former title winning side available for the Reserves and you would expect them to challenge for the top half of the table currently in 6th a win today would put them right amongst the top 4. The venue for today’s match one of the best available to a women’s side in Norfolk, Fakenham Town Ladies playing at Clipbush Park on the main pitch along side the men’s 1st team. The ground has practice pitches beyond. The main pitch with a small seated stand one side the changing rooms an clubhouse opposite with a bar and hot drinks available. A good sized pitch offering plenty of width. A bright day, but chilly no wind a few clouds around the sun starting to set behind one of the goals. The new hat was needed to protect the ears. 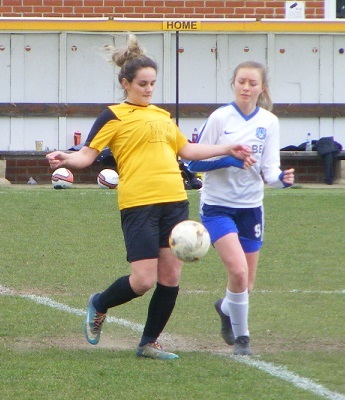 Fakenham Town Ladies starting XI – Chloe Easter, Jennie Codman, Selina Goodrum, Karina Townsend, Jemma Riches, Natalie Wright, Fanny Danskanen, Sophie Anderson, Rochelle Woods, Sam King (C) & Sian Sands. 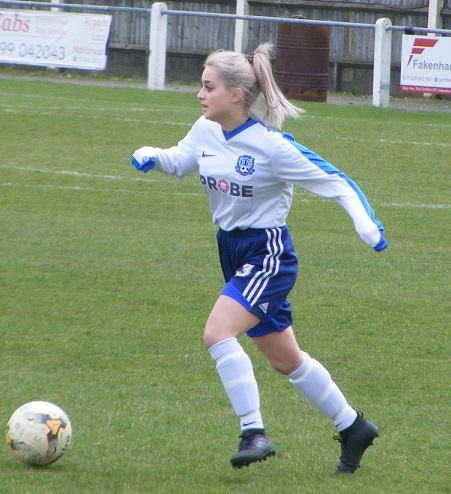 Subs – Maddie Smith. 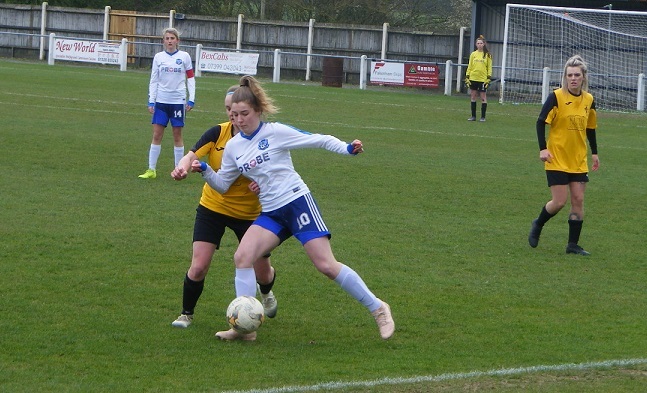 Wymondham Town Ladies Reserves starting XI – Laura Watson, Gemma Perry, Leanne Smith, Emma Chambers, Mary North, Laura Hammerton (C), Alice Collins, Emily Anderson, Gabby Stone, Sally Hammerton & Eleanor Norton. 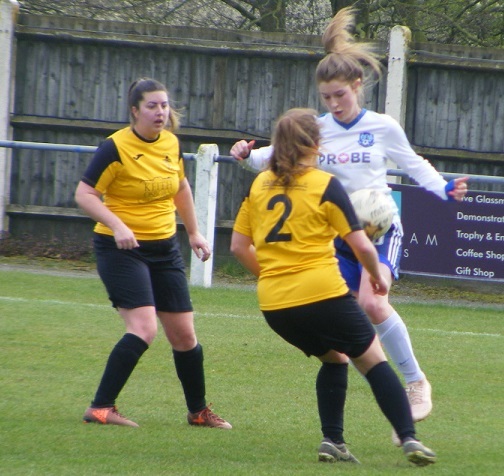 Subs – Amy Burton & Emily Bullett. A change of half at the coin toss with Wymondham opting to have the sun setting behind goal at one end behind their backs, Fakenham to kick off the 1st half wearing Amber coloured shirts with black across the heart and down the left sleeve, black shorts and socks. Wymondham wearing red shirts with black shorts and socks. Keeping the ball at the back Fakenham spread play out to the left Natalie Wright with the threaded pass forwards for Fanny Danskanen to attack down the right, Leanne Smith playing left back for Wymondham gets across the winger to play the ball out for a throw. Wymondham captain Laura Hammerton gets hold of the ball in the middle of the park plays the ball forwards towards the right of the box with striker Sally Hammerton making to run, Fakenham’s Karina Townsend goes with her putting the tackle in to send the ball away for a throw in the right corner. Winning the ball at the back the pass into midfield finds Jennie Codman taking the ball on sends it forwards looking to play Sian Sands in through the middle, a good starting position from Wymondham goalkeeper Laura Watson sees her kick the ball clear from the edge of her area, not aware the flag was raised for offside. Good build up play from Fakenham getting players forwards as the ball is carried over half way into the Wymondham half the diagonal pass finds Rochelle Woods in space on the left crosses the ball along the box finding captain Sam King at the top of the D, good control flicking the ball up off the ground to strike on the half volley from 20 yards out sends her effort wide of the far post. A good start from the home side Wymondham hit them on the counter the ball played on for Sally Hammerton moving right side again goalkeeper Chloe Easter moves out to that side of her box to kick the ball clear instead plays it straight to a Wymondham boot 25 yards out central the shot comes in low Wright getting the block in as the defence back pedals to protect the goal. GOAL! The cleared ball spins out to the left wing coming forwards Gabby Stone plays the cross in early heading into the six yard box is straight onto the head of Sally Hammerton at the far post unchallenged a deft header to loop the ball up back across goal to drop over the line to give the visitors the lead inside the opening 10 minutes 0-1. Sally Hammerton scores the goal to give Wymondham the early lead. A positive response from Fakenham straight from the restart the ball at the feet of Wright she carries it forwards from the back over the half way line a great ball forwards sees King giving chase to the ball inside the Wymondham box, the ball defended by Emma Chambers conceding the 1st corner of the game. Wymondham defend the near post the ball played back to the taker the 2nd ball in headed clear. 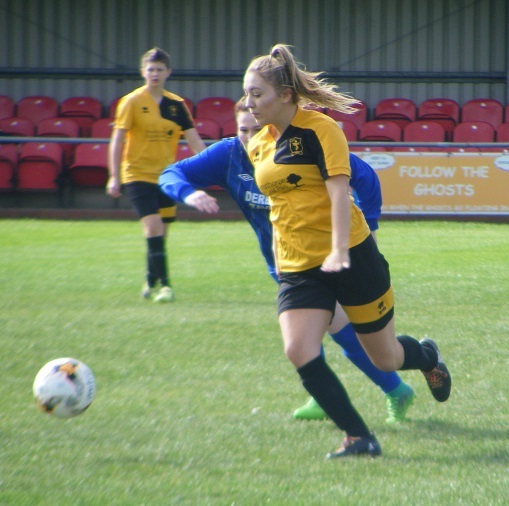 Fakenham make a change bringing of Sophie Anderson send on Maddie Smith the change seeing Wright move forwards into a midfield role. Fakenham bring the ball forwards Wright in possession on to Woods moving left her pass on for Sands on the left wing reaching the top of the area whips the cross into the box, Mary North heading clear at the near post for Wymondham. Danskanen wins Fakenham a throw attacking down the right wing the ball put into Wright is fired into the area, a mis-cue from Watson as she goes to kick the ball to safety misses, turns to see the ball race harmlessly wide across her goal. GOAL! The momentum remains with the home side pushing bodies forwards Wright with a great crossfield pass picking out Woods on the move down the left wing in behind the full back reaching the box strikes the ball her rising shot flying towards goal smashes against the crossbar dropping down into play Watson attempts to catch in with King rushing in the keeper loses it and it drops over the line 1-1. Wymondham make a change Amy Burton coming on for Emily Anderson. Fakenham pressing the ball well attacking the ball with Sands 25 yards out left side releases a shot looks to be heading well over as she connects but dips very late threatening to drop under the crossbar Watson on her line with a very good claim. Wymondham look to get the ball forwards into their attackers, out left side Stone wins a corner the ball into the area a good one defended at the near post is cleared out towards the top of the box, met by Eleanor Norton she hits the shot back on the low ball getting through the crowd races wide of the post. A competitive contest especially in the middle of the park, Fakenham having runners willing to go whenever the ball is in their possession. Smith on the overlap on the left for Wymondham gets forwards as Laura Hammerton regains possession inside the Fakenham half her pass finding the full back her cross fired in low towards the area is cut out by Selina Goodrum for Fakenham. Woods is fouled 25 yards out a free kick to Fakenham the ball played into the area won by Chambers. Watson soon after claiming at her near post as Sands whips in the cross from the right. GOAL! Fakenham turn the game around having come back from a goal down now take the ur pushing the lead with 5 minutes left to play in the 1st half. Pushing forwards the home side have Woods on space on the left the pass picking her out she takes the ball on before firing a great cross along the top of the area, runners coming in, Danskanen amongst them far post running onto the ball fires her shot past the keeper to bury the ball into the back of the net 2-1. Wymondham look for a quick response getting the ball out to Norton out wide left she plays the ball into Sally Hammerton positioned at the top of the area, looking to let the ball run across her body and turn onto the shot is closely marked by Townsend the defender blocking to strike as Hammerton goes to shoot the ball spinning away wide for the throw on the right. Norton with more good work on the left taking her marker on and getting the cross in towards the near post, Easter with a good claim. Fakenham continue to press well players attacking the back four pushing the Wymondham defence deeper making it harder for the visitors to get the ball forwards with sufficient numbers to attack when they regain possession. Codman with the ball into the box looking for King cut out by North her clearance cleared by Laura Hammerton before Woods can race onto it 25 yards out. From a throw in deep on the left Codman with the ball whips a vicious ball through the Wymondham six yard box Danskanen arriving far post under challenge from Smith can’t get anything on the ball to deflect it towards goal. Almost a moment of magic from Woods as the ball comes into her from the midfield position in a central position just inside the Wymondham box brings the ball down on her chest flicks it up with her right foot the spinning strikes the ball on her volley with her left the ball whipped in towards goal curling wide of the right post. Great combination play between Wright, Danskanen and King on the right side the cross fired into the box cleared by Chambers. An entertaining 1st half at Clipbush Park, Fakenham Town Ladies doing well coming back from conceding an early goal to lead 2-1. Pushing the Wymondham defence deeper with players pushing forwards and limiting chances up the other end. Wymondham not managing to do the same up the other end giving the Fakenham defence time to get into position. The sun getting lower in the sky the temperature dropping rapidly very chilly now the action resuming with Wymondham kicking off the 2nd half. Intent from the visitors straight away the ball with Sally Hammerton wide right plays the pass in towards the top of the area with Collins breaking forwards from midfield, Townsend stabbing a foot in to take the ball away from her, Norton arriving connects with the cleared ball fires her shot in low wide across the Fakenham goal. Receiving the ball from a throw on the left Laura Hammerton takes on the shot from all of 30 yards out her effort flying wide of the target. A strong start to the 2nd half from Wymondham who stayed out on the pitch during half time Fakenham a little slow to get going. Wymondham getting players forwards from midfield to support the attackers, Laura Hammerton and Collins both making good runs. GOAL! It’s one of these runs that brings about the equalising goal, Laura Hammerton bursting forwards with the ball goes on with her run as the pass finds Sally Hammerton on the right wing she plays the ball forwards on for the midfielder breaking into the box right side she squares the ball across the six yard box for Norton running in with her the no 9 firing the ball home to make it 2-2. 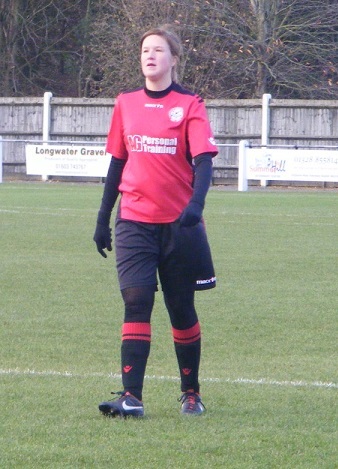 A change for Wymondham after the goal with Emily Bullett coming on to replace Perry at right back. Fakenham come forwards King running in behind on the right side taking the ball down the line sends the cross in angling towards goal, Watson at her near post take it cleanly. 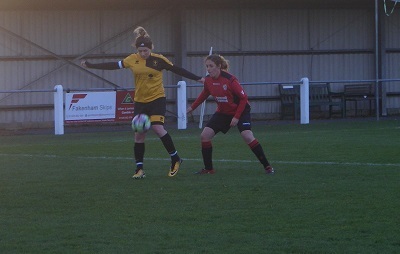 Fakenham keep possession around the Wymondham box eventually winning a corner right side the ball is headed away at the near post dropping to Codman outside the area looks to drag the ball between her legs make room for a shot but closed down gives away the foul. 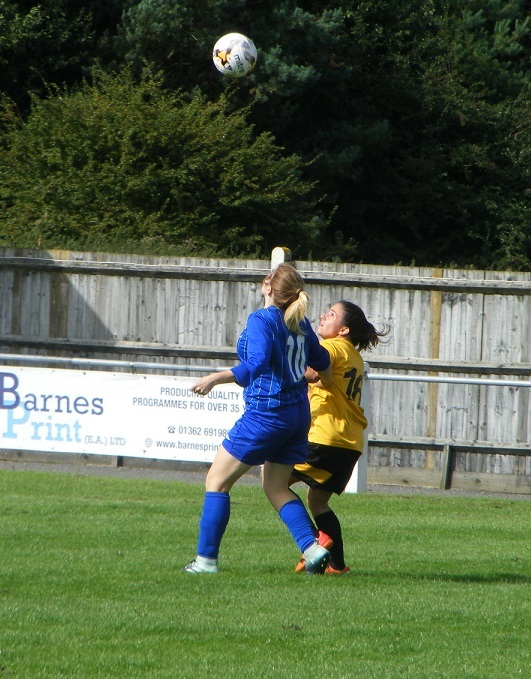 Wymondham’s Laura Hammerton is fouled as she attempts to hold on the ball on the edge of the area from a throw in. Taking the set-piece herself Hammerton strikes the ball well aiming it low in towards the near post Fakenham have plenty of bodies there the ball skimming off the post however as it is cleared for the corner kick. GOAL! Collins taking the corner on the left sees her 1st attempt in towards the near post headed behind for another corner the 2nd attempt put into the same area sliced behind for a 3rd corner. From this Wymondham retake the lead the delivery going further towards the top of the area Danskanen getting up highest to head the ball her effort turned towards her own goal, wide of Easter nothing she can do except watch it land in the back of her net unfortunate from the home side Wymondham having started the 2nd half well lead 2-3. The response is quick in coming from falling a goal behind as it has been from both sides so far in the match, Wright playing the ball into Woods moving clear into space left side a touch inside before sending a 25 yard shot curling in towards goal, aiming top corner the ball whistles past the wrong side of the post. A high ball played in towards the Wymondham area by Fakenham the visitors struggle to get it away dropping for Woods central 20 yards out her shot is deflected wide for a corner kick on the right, players coming forwards for the set-piece Wymondham clear at the near post the break is on the ball played up field into Sally Hammerton she carries it on has support through the middle from Collins giving her the ball sprints on into the box Collins playing the ball on, Easter comes out well to claim the ball before Hammerton can reach it. Fakenham from a throw deep on the right King linking up with Danskanen her cross fired in low into the box into Woods’ feet she lays the ball off for Wright coming in her shot his charged down by Chambers, back out to King wide right her cross back in headed away by North. Stone is hurt after a sliding challenge needs to come off for Wymondham, Perry returning to the action. King picking up the ball from inside the Wymondham half takes it forwards left side taking on three players before unleashing a shot her effort blocked the clearance running straight into Danskanen she sends her shot from 25 yards out over the crossbar. Fakenham make a change Anderson returning to the pitch in place of Woods. King with another run with the ball coming into the Wymondham area from the right this time doesn’t get past Chambers. Goodrum clears the ball for a corner after Easter makes the save with her legs on the edge of her area with Sally Hammerton running in behind the defence played through by Collins. The corner whipped in from the right is almost turned in by the keeper as it comes in near post head high getting a glove on the ball it flashes across the face of goal before being cleared. Up the other end a great starting position from Watson denies King a shooting opportunity as she is put in behind by Wright the keeper launching the ball up field. More good link up play between Laura and Sally Hammerton the midfielder sending the ball through the centre for the attacker to chase heading towards the box checks her run holding up the and losing her marker shapes to shot outside the box left of the D curling the ball in towards goal, is straight at Easter the goalkeeper plucking the ball out of the air. North on a free-kick for Wymondham inside the centre circle plays a great ball into the area over the defence falling left side gathered by Norton she wraps her foot around the all her cross caught by Easter at her near post. 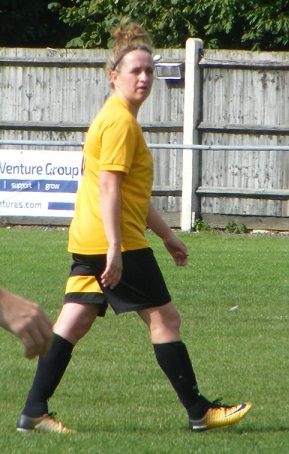 Woods returns to the pitch for Fakenham. GOAL! 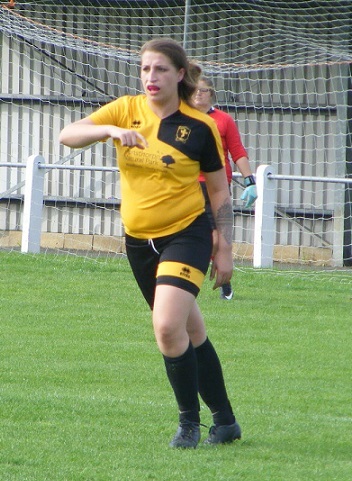 King is a willing runner up top for Fakenham and when she gets into full flight a challenge has to be timed well, breaking in behind as the ball is played on towards the area right side Watson comes sliding out brings King down, concern as she goes down inside the box has a troublesome ankle the referee points to the spot a penalty kick awarded Watson shown a yellow card. Anderson comes back on for Fakenham King on her feet limping off. Sands to take the penalty a confident strike hit with plenty of pace rising Watson gets a glove on the ball but can’t stop it sailing into the top corner as Fakenham come back from behind to level for the 2nd time in the match 3-3. 5 minutes of regular time left to play the light starting to fade. The game is a little stretched a few tired legs out there. 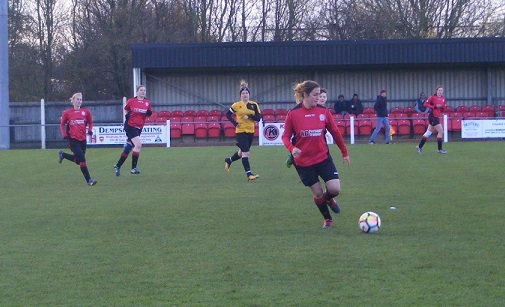 A long clearance by Smith at the back for Fakenham has Woods running in behind, Watson does well to take the ball safely into her body as she is closed down. Townsend defends well against Norton as the attacker looks to get into the box the ball behind for the corner. Late into stoppage time the ball is played into the area from the left Fakenham successfully defend at the near post the ball behind but no time for another corner as the referee blows the final whistle. The points are shared the sides drawing 3-3 Fakenham coming back from behind twice to equalise a fair result over all, and entertaining game a good watch for the neutral although I was probably the only one there. An early lead for Wymondham, Fakenham responding well a strong 1st half seeing them overall the deficit to lead 2-1. Started slow 2nd half and Wymondham didn’t came back strongly themselves to get back into the game and then retake the lead only to concede a late penalty and see Fakenham level the scores. 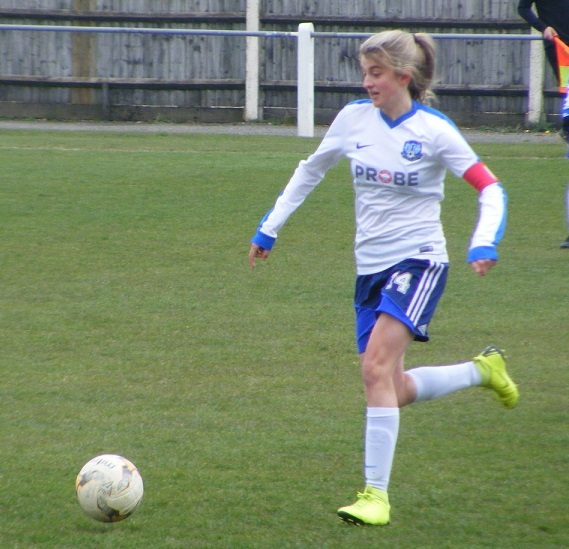 These decisions never get any easier, picking today’s Women’s Football East – Player of the Match good performances all over the pitch in midfield in particular, Laura Hammerton having a good game getting hold of the ball her midfield run in the 2nd half getting Wymondham back on level terms. 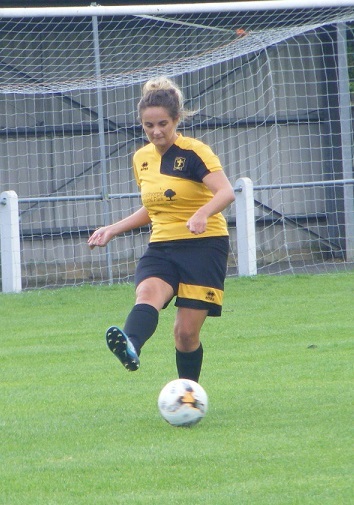 Also doing a great job in midfield today was Fakenham’s Natalie Wright having started at the back with some good challenges and runs her move into midfield spurred the home side on and from it the momentum turned 1st half so today’s Player of the Match goes to Natalie Wright. My thanks to both clubs today for helping me out at short notice with the team details, a good game to watch plenty of action as is always the case in Norfolk. 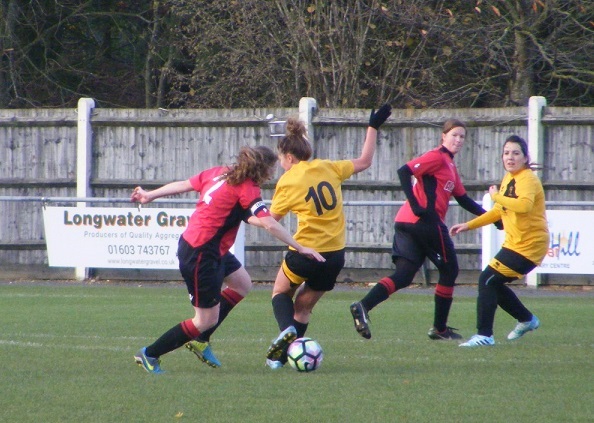 This entry was posted in Match Reports, Norfolk Women's Division One and tagged Fakenham Town Ladies, Match Report, Norfolk Women's Division One, Wymondham Town Ladies Reserves on November 26, 2017 by WFEast.